Lots of countries have a signature tourist site - Eiffel Tower, Harbour Bridge, Great Wall, Taj Mahal etc - something that everyone (except the most insular American) would recognise. 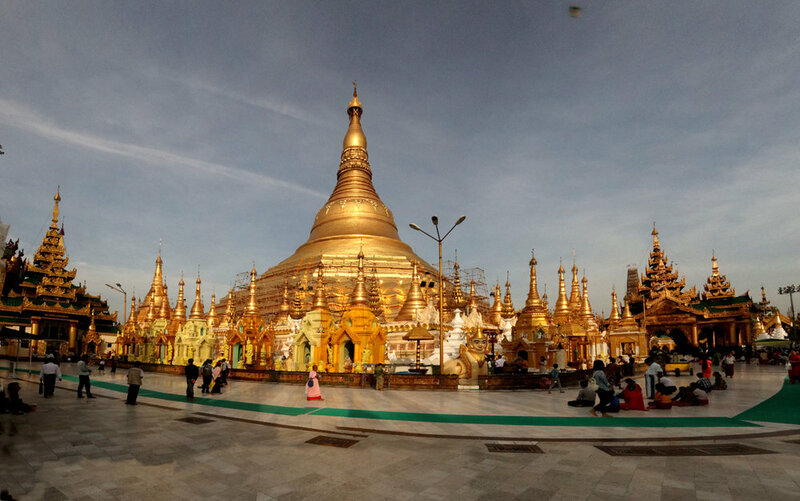 Myanmar, like New Zealand, doesn't have one, but if it did, it would be the Shwedagon Paya (Pagoda). Sitting on a small hill in Yangon, its 100 metre-tall central zedi (stupa) is covered with 27 tonnes of gold leaf and thousands of diamonds and other precious stones. It seems incongruous to have such wealth in such a poor country, but Burma is hugely rich in natural resources, including gems. It also has lots of fertile land - in fact it was at one stage the world's largest exporter of rice. For the military government under Ne Win to reduce the country to one of the 10 poorest in the world in just a couple of decades was quite an achievement. Very early in the morning there are candles all around the main zedi - later they all get cleared away. Health and safety? Probably not! The Shwedagon zedi is also said to contain eight hairs of the Gautama Buddha and some other relics from three other Buddhas - a washing robe and a water filter, among other things. Elsewhere in the complex there is a tooth relic - a slightly gross thought, although not as bad as toenails. However holy, I don't think I could worship a toenail. The legend of the Shwedagon Paya is that back in the mists of time when the Gautama Buddha has just attained enlightenment, he met two Burmese merchants who were travelling overseas. They offered him alms food and were rewarded with eight strands of hair as a blessing. Back in Myanmar, the merchants gave the hairs to the king, who built a zedi to put them in. Over the next 1500 years or so, various rulers made improvements. The fifteenth century Queen Shinsawbu, for example, offered her weight in gold leaf to cover the stupa. Unfortunately, she was a petite lady, weighing less than 40kg, but her son-in-law took up the challenge, offering four times the combined weight of both himself and his wife. These days it's not just the one zedi on the site - there are two other large gold-plated stupa, plus lots of prayer halls, sacred wells, Bodhi trees, Buddha footprints, a medicated pond (cures all diseases), and hundreds and hundreds of Buddha images, many adorned with gold. I'm not sure how the faithful choose which Buddha to pray to - there are just so many. Do you share your favours around, or do different images listen to different requests? Just one of hundreds of Buddha images. I love the psychedelic lights on the halo. There are all sorts of permutations of colours and patterns around. The guide book suggested going to Shwedagon at dawn or dusk, and we initially chose the latter. Bad move. Every tourist in Yangon was there, many of them scantily clad, despite the many signs urging respectful clothing. It made me cross. So we tried again early the following morning. The place was already busy at 6am, but this time it was full of Buddhists - local and foreign - doing their Buddhist thing. Pink-robed child nuns ate breakfast and then chanted from prayer books. Monks sat in niches in front of Buddha statues and also chanted; lay devotees sat on the ground in front of the pagoda, bowing and chanting. People rang the prayer bells, offered flowers and fruit, and poured water on the Buddha image representing the day of the week they were born. In one corner there was a large group of what looked like local business people whose prayers were led by a monk. Perhaps a business deal successfully completed, or in need of divine assistance? You pull a cord and it fans the top of the Buddha's head. The fan is the curtain-looking thing.